BMW’s new 4 Series Convertible will be lower, wider, longer and more efficient than its outgoing 3 Series counterpart, it has been confirmed. Priced from £36,675 and available to order from March 8, 2014, the addition hits 0-62 from 5.5seconds, with economy up to 58.9mpg and CO2 emissions from 127g/km. Buyers have a choice of two petrol and one diesel engines, with the vehicle available in SE, Sport, Luxury, Modern and M Sport trim levels. 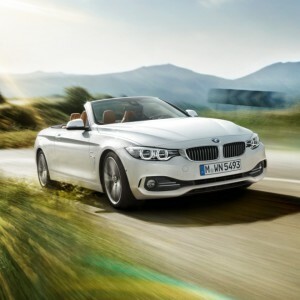 BMW claim the 4 Series convertible is a ‘sporting yet elegant car, roof raised or lowered, that is clearly distinguished from its 3 Series brethren’. The folding metal roof can be raised or lowered in 20seconds, with the optional wind deflector now available for storage behind the seats. A new Air Collar system blows warm air around the necks of front seat occupants for open-air driving on cooler days. As standard, the 4 Series is fitted with front and rear parking sensors, heated electric front seats, Servotronic steering, a Sport-multi-function leather steering wheel and Xenon headlights. DAB radio, Dakota leather upholstery with SunReflective technology, two-zone air conditioning, cruise control, Bluetooth, USB, Comfort Go, Drive Performance Control, iDrive Controller and 6.5inch colour screen are also available.